Square Field, Aberaeron, Cerdigion, Wales. The tiny West Wales town of Aberaeron, in the heart of Waless Welsh Pony & Cob breeding country plays host to a Welsh Breed spectacular in August of this year. Based on Portugals Golega "horse spectacular", where the Lusitano breed is the main attraction amongst thousands of horses from many different countries, the Aberaeron event will feature displays of Welsh Ponies & Cobs being ridden, driven and shown in hand. Featuring animals from the most famous Welsh Pony & Cobs studs in the World, the whole of Aberaeron will be taken over for Sunday 11th August. In addition, a display of horsemanship by one of Europes leading stunt riders, Daniel Naprous, who has featured in many films such as Braveheart, Merlin and Jayne Ayre, will add colour and daring to the whole day. 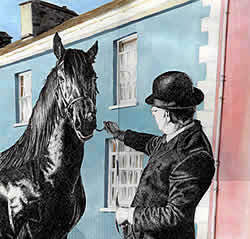 The Festival starts at mid-day with a pageant, denoting the history of Welsh Ponies & Cobs, from the early evolution to the travelling Stallions of the late nineteenth and early twentieth centuries, through to the all round use of the animals today. Large crowds are expected and preparations are well in hand for a spectacular day to celebrate over a century of Pony & Cob breeding in Wales, together with the Queens Golden Jubilee.